Andrew Traviss, a TOJam veteran and OJ founder, delivers a post-mortem worthy of Gamasutra. I played an early version of "Reentry". Learning how to control that ship was both fun and frusterating (on purpose). When you finally achieve a Lunar Lander degree of control, you feel very smart. Andrew's post will leave you with the most precious gift of all... words. Andrew Gardner and teh Andrew Gardner Group of Companies created "Throw That Fight", a hilarious looking game I've been hearing a lot about (but did not get a chance to see). The man does sketch comedy in real life, which is amazing. 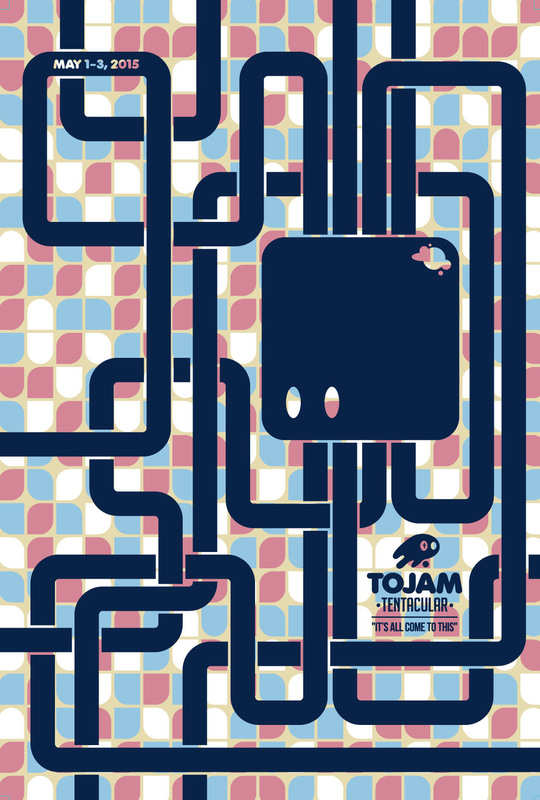 If you've never attended TOJam, this April 24th Twitter might convince you: "This is a nice, reasonable group of people." 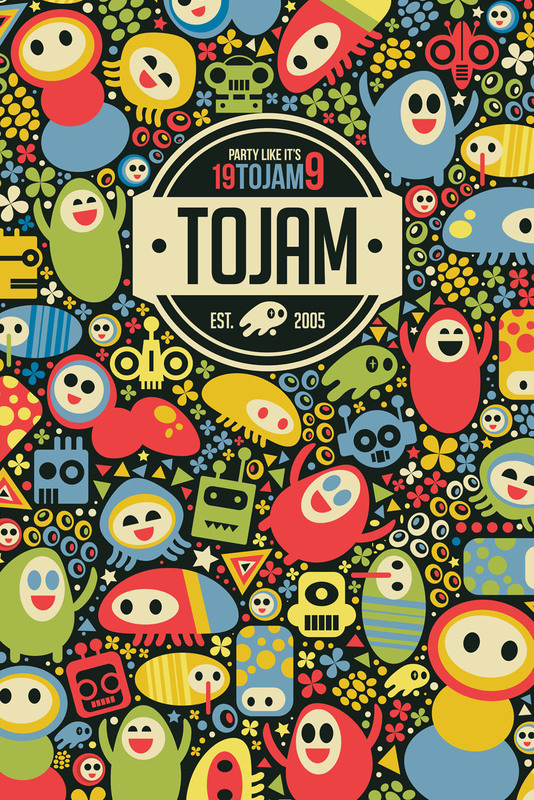 JPLC details his not-so-good experience at TOJam #5. 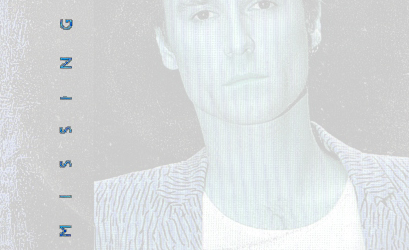 "It felt to me just like constant pressure. Some may find that fun, and maybe it would have been if I had been in a team, but I was NOT digging it." It's actually more like constant, horrendous, all consuming, nightmarish pressure. Harry Mack talks about sound floating! 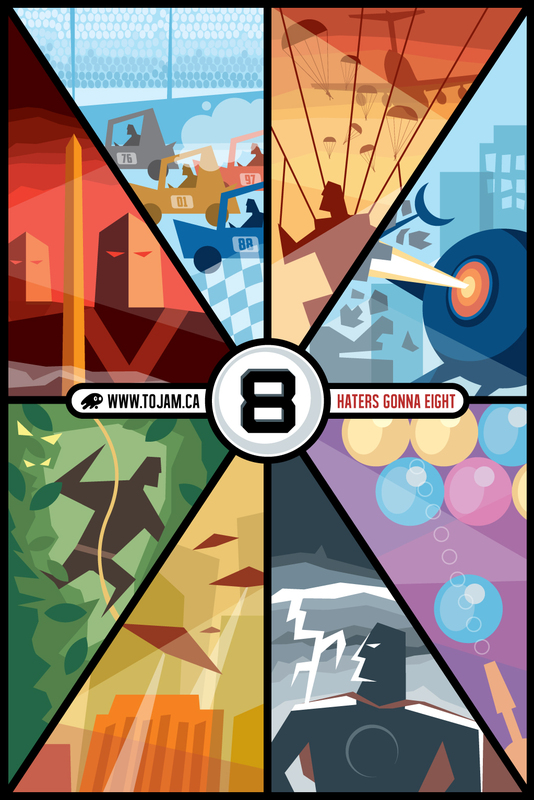 Floaters are the unsung heroes of TOJam, and I'm glad Harry had a good time. How hard do floaters work? Harry's first entry is Friday 3:00pm. His next entry? Sunday 11:00pm. Note: HillBilly Willy is my new favourite song! 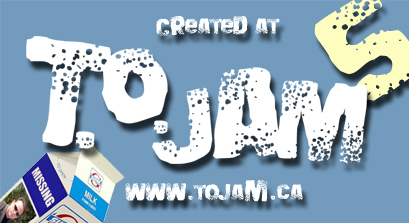 Steve Kupferman returns to TOJam and gets the inside scoop on pizza mountain. The ongoing coverage from the Torontoist is truly appreciated. Ryan once again creates a pithy summary of our event. Be sure to read his brutally honest coverage of previous jams as well (links at the bottom). 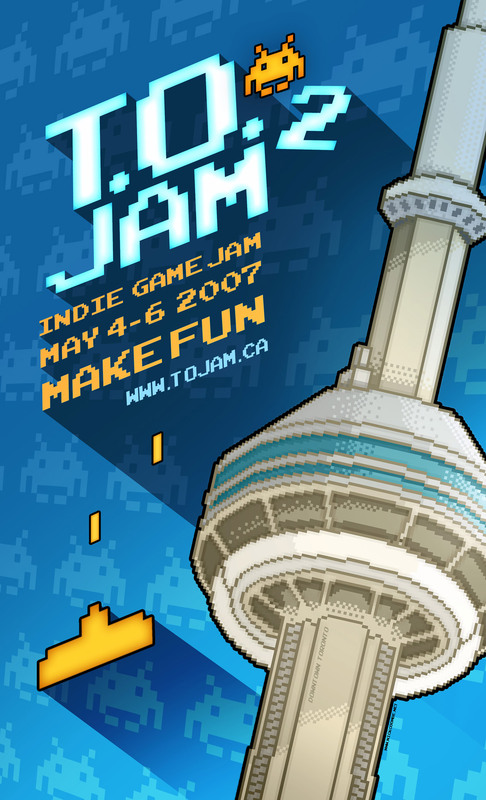 Ryan has been a huge supporter of TOJam over the years, and is Toronto's secret weapon. Alex is not only a veteran TOJammer, but a development video maniac. He's detailing everything he went through in 18 small pieces. The first 6 clips have been posted, and we'll post again when there's more. NotSoft is bignobody, which is about as clear as I can be. Great writeup including huge pictures and some video to boot. The raw data contains some priceless moments including "7:35 - Oh hell... Am I still here?" and "9:53 - Back with 3rd 2L of coke for the Jam and another 4 Vegetable Samosas." Be sure to check out his pixel art T-shirts. A simple scheduling conflict with Ludum Dare escalated into all out war. Confession: I helped escalate it. Anyways, due to unforseen circumstances, my team didn't fully materialize, so there's not much of a game. Still, I was able to write a very flexible 3D physics engine for rays, spheres and boxes. It'll come in handy for next year's game, which will be amazing. You'll see! It'll shine with such blinding glory, you won't see it at ALL! MWA HA HA HA! Otherwise, the venue was fantastic. I'd never seen a real Acadamy Award before, which they had in the lobby. The internet was blazing fast, if you could get it set up. The special guests were equally excellent. Finally, I have to give enormous credit to the organizers and sponsors. Every TOJam they produce a miraculous feat of unyeilding administrational power. 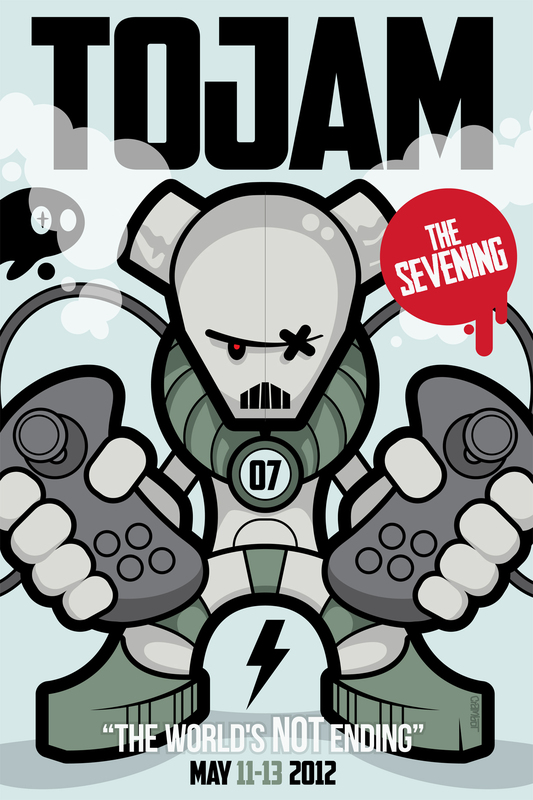 See you next year, and God save TOJam's lunatic fringe! but srsly..srsly guys...best TO Jam yet! HUGE thanks to all the organizers and sponsors. Holy #%@&...SPONSORS!!! Looking forward to the arcade in June! Also, about the verification question...what I'm human and just really bad at math??? Really freakin' awesome. So many days of awesome. You think you're funny, but I beat you to the punch. I married Mari a couple of years ago! I'll definately be dragging her along to show off all the great games in june. ... how'd we end up with so many Kyles? Loved the new location, great atmosphere. Wish New Team could have stayed for the demo'ing on Sunday, but we had an Exam the next day. Looking forward to the Pub Night! Simple math people; 3 days + nearly no sleep + redbull = Socio-coders! And of course a LOT of awesome games! I think I`m pregnant. thanks TO jam. 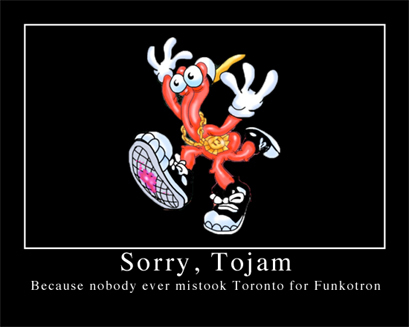 I was a little worried at first that it just wouldn't feel like TOJam if the space didn't seem shady, but George Brown compensated for lack of shadiness with free pizza and proximity to The Patrician and Tim Hortons. Well played, George Brown. Well played. Ah, TOJam. Though it was only my second one, the jam has become one of the highlights of the year for me. It's like running a marathon with your fingers and brain. A test of endurance and mental stamina. Thanks once again to the organizers and sponsors for making this the best Jam yet! Also, Hail to the Monster King, who made this jam a little extra surreal. Well, I wished I'd shown up at the very beginning and took better advantage of the community that was there instead of working remotely. I was pretty amazed by what I saw and look forward to downloading and trying the games out. Next year, maybe I'll float to get my hands dirty in the variety of art styles needed. Thanks for putting this on guys. Wow what an experience from drinking toxic amount of redbull to actually pumping out a working game after being awake that long. 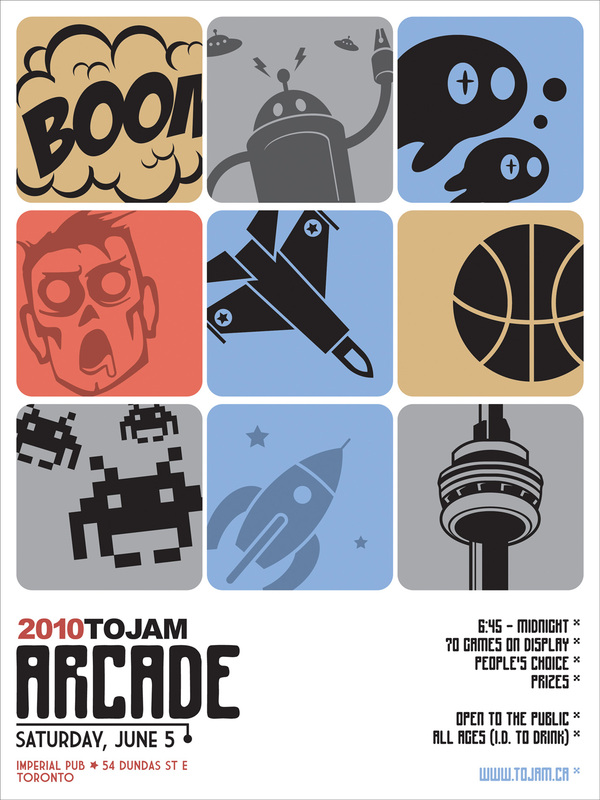 Can't wait for the arcade and the next Jam. The fruit tray was intense. OK, Jim? This thing pops up a simple addition question and afterwards says that only I can stop the robots. If you've ever seen any technophobic 1970s-80s sci-fi actioner, you'd know that the only way to stop a rampaging super-sentient computer is to instruct it to divide by zero. Now go watch Electric Dreams, for Christ's sake!